As a yoga teacher an understanding of functional anatomy is critical to being able to identify weak and under-functioning muscles and which yoga poses to use to engage them, build strength and flexibility. This 2 day experiential learning course focuses on the 12 structural muscles that protect the spine and hold the skeleton in place. This Functional Anatomy and Kinesiology module is 2 days in duration and will provide all students with the ability to perform many muscle testing and correction techniques to complement your full body Yoga massage. 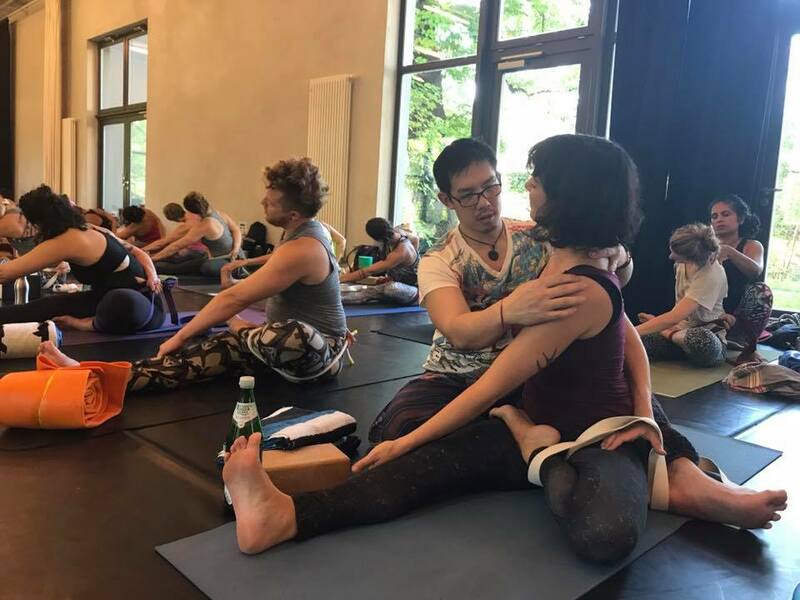 This module led by Jambo will go even deeper into the anatomy of postures and inter-relationships of the muscular skeletal systems. These structural muscles are underused in our modern day living and underworked in most of our physical activity, yet have a huge relationship to the nervous system and functional movement. By gaining a full understanding of anatomy you will be better placed to support your students and grow their practice. A Transformational weekend led by highly trained facilitators, Jambo, Rebecca Dennis & Michele Barocchi. Within this unique event and collaboration, we will be showing you how to set your own pillars of protection toenable a safe navigation for deep healing. Using the modalities that we share, you can gather tools that are right for you as you prepare, go deep, integrate your unfolding and return to wholeness. Most of us have experienced mental, emotional or physical trauma on some level, which can restrict our breathing and capacity to feel. The resulting body armouring and muscular tension can endure and manifest over the years. 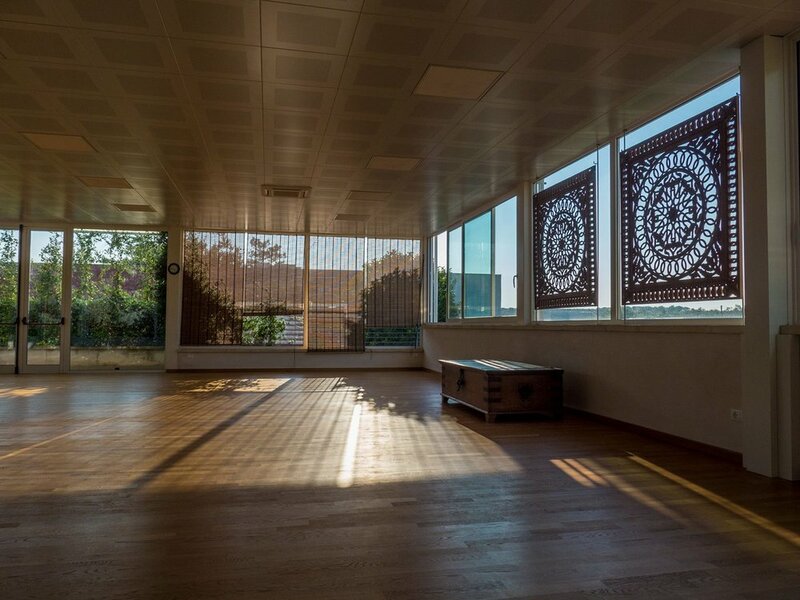 By consciously integrating trauma through a combination of somatic techniques, sound, movement, bodywork, meditation and ceremony participants will gain a greater sense of connection, embodiment, expansion and freedom in their every day lives. On this transformative weekend, as a collective, we will create a safe environment for you to explore, connect and let go of the armour that is keeping you from living fully. You will be guided each day through experiences that free your physical, mental, emotional and spiritual being. Learn about your own unique breathing pattern and how it affects your life. Work with your intentions to create change in your life. Leave with tools and support to continue your experience on this transformative path. See how emotions get stuck in the body and learn about the scientific evidence and research that supports how the nervous system and breath respond to trauma. As a collective, we will create Ceremonies to hold you and the group in a safe and nurturing space. Make choices, take action, and create your own rhythm so that the magic of Life can support you. 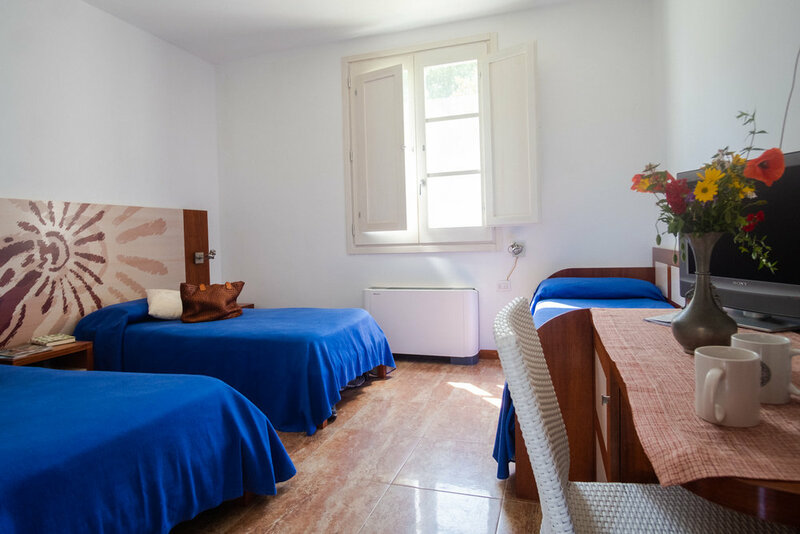 This weekend is limited in numbers so please book early! 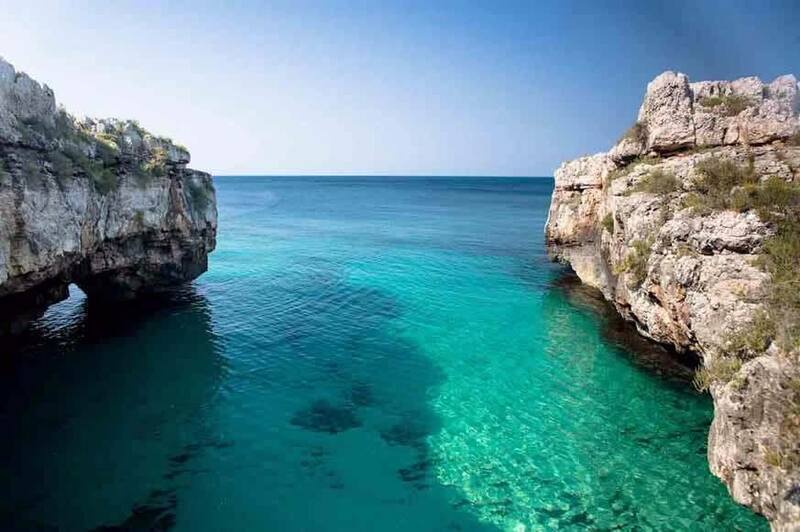 Manifest a week of pure yoga magic all set in the beauty of Puglia, Southern Italy, enjoying ‘la dolce vita’! This immersion is a light and fun way for students to gain a more in-depth knowledge of all aspects of yoga. 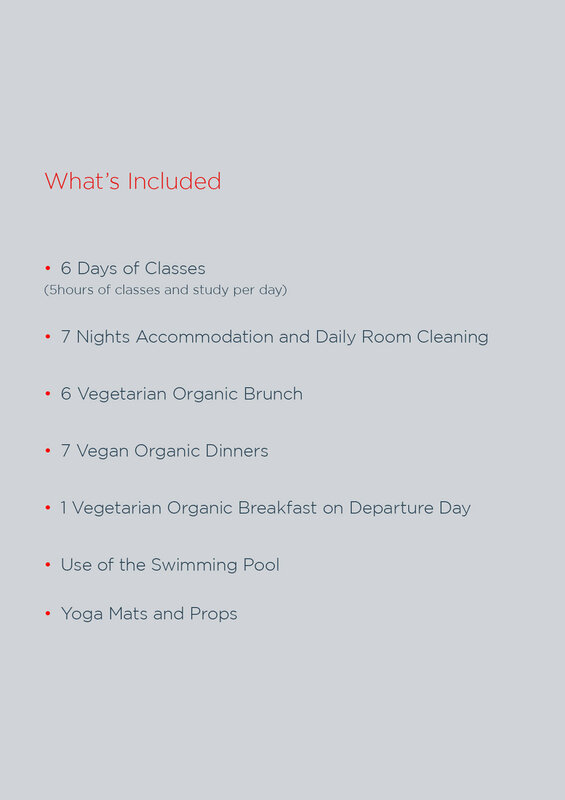 Alongside a daily full asana practice, meditation and pranayama, you will learn the correct alignment of poses, focus on anatomy, learn yoga philosophy and explore aspects of yoga such as the energetic and subtle body. 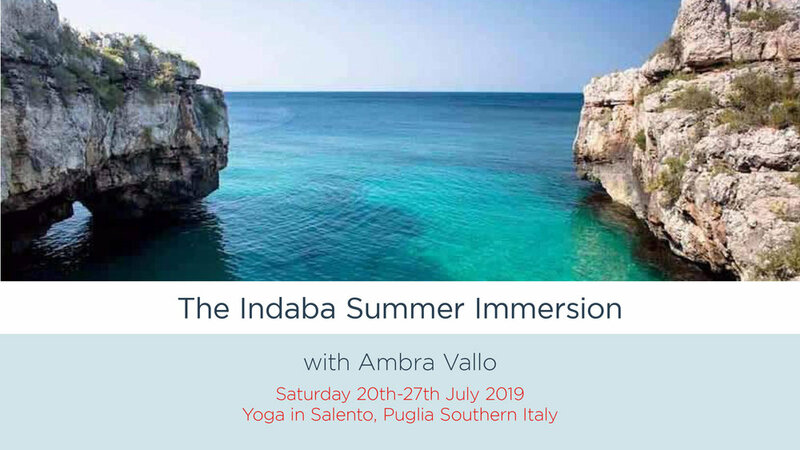 Hosted by Indaba’s 200hr YTT lead teacher Ambra Vallo, her fun and spontaneous teaching follows the lineages of Dharma, Ashtanga, Forrest and Rocket yoga. 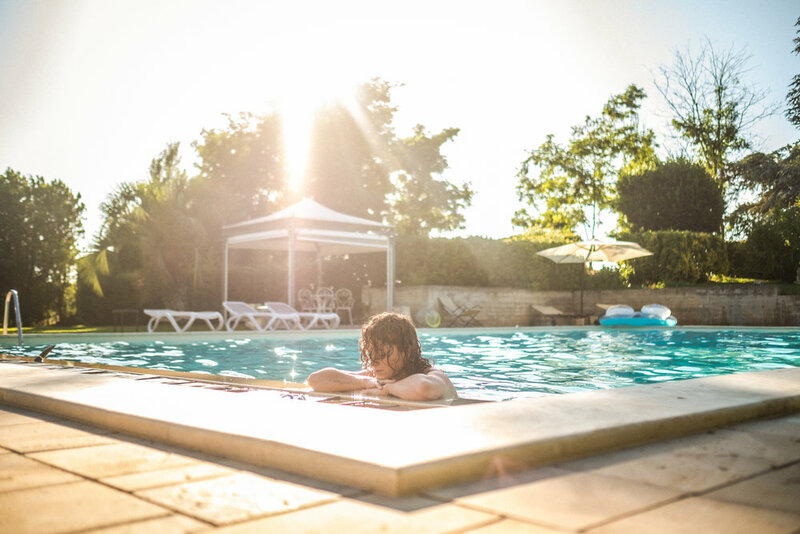 Our breathtaking location is the ‘Agricola Samadhi’, a last generation organic farmhouse located in southern Puglia complete with yoga shala, organic kitchen garden, spa and swimming pool just 20 minutes from the most beautiful beaches. 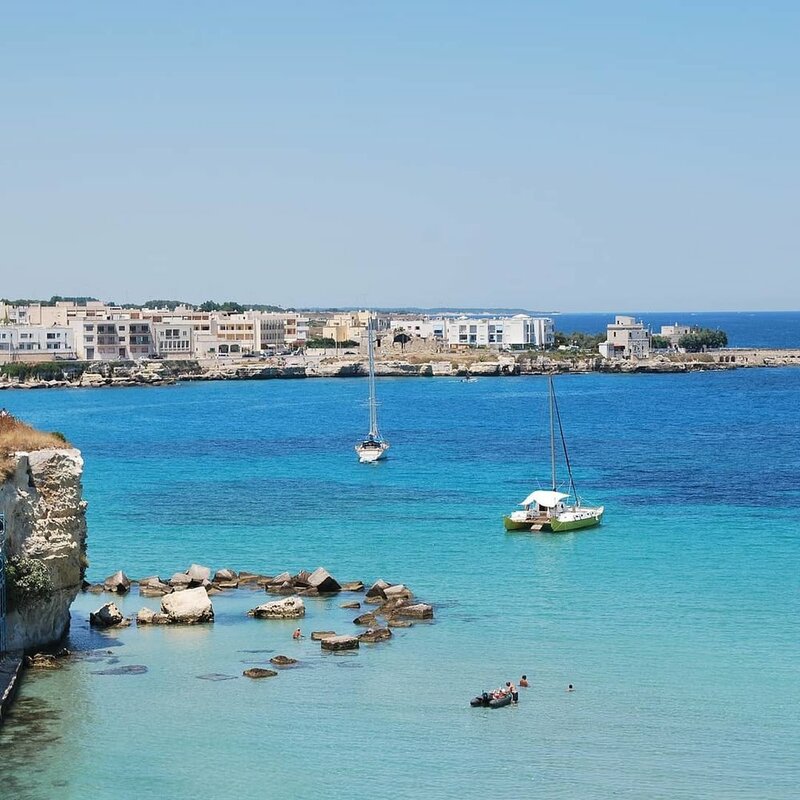 There is also lots of activities such as horse riding, biking, trekking and sailing to try locally. Freshly prepared brunches and dinners are served almost exclusively with seasonal ingredients from the organic garden or other local organic products. 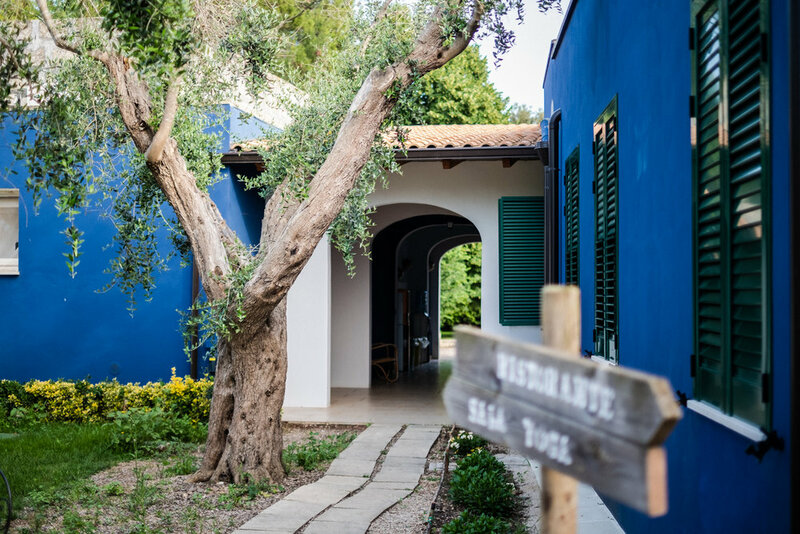 Each meal will be served on the sunny terrace overlooking the land where the organic fruit, vegetables and extra virgin olive oil are grown. 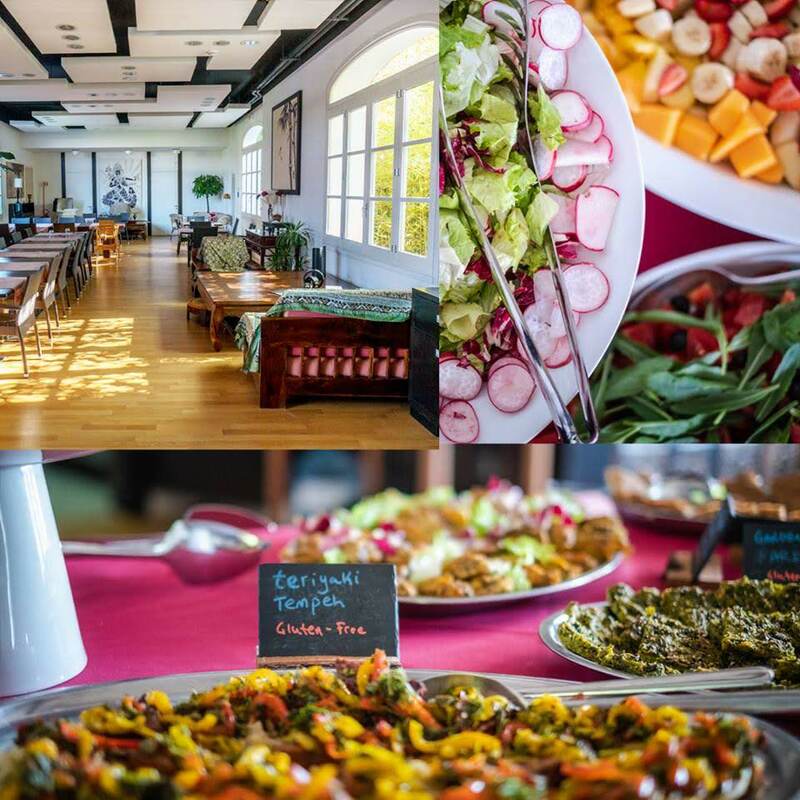 The farm prides itself on serving fresh sattvic vegetarian and vegan dishes to help you feel light, balanced and energised during your holiday. You arrive on Saturday and the first class will be Sunday morning and the last class will be the Friday afternoon. The six days of yoga consist of a daily 4 hour class each morning (with a break) and an hour long yoga lecture each afternoon. 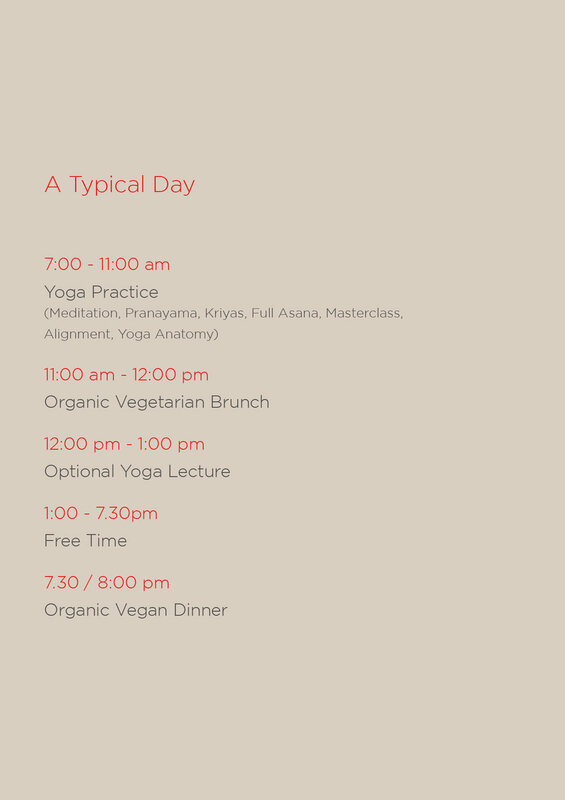 Each day there will be meditation, pranayama, a full physical practice, kriyas, focus on correct alignment of poses, yoga anatomy and a different focus in the lecture such as yoga philosophy, mythology and the yogic body. She is a former principal ballerina with the Birmingham Royal Ballet. She turned to yoga on a path to recovery from injuries and slowly over the years she fell in love with the more subtle, spiritual parts of the practice. Retiring from dance allowed her the time to focus on her passion and to undertake further training in Ashtanga Vinyasa (500hrs), Dharma Yoga (800hrs), Rocket Yoga (500hrs), Forrest Yoga (200hrs and Advance TT), Tripsichore (200hrs), and Gokul Vinyasa Yoga (300hrs). Ambra’s teaching is fun and spontaneous following the lineage of Larry Shultz, Ana Forrest, and Sri Dharma Mittra. Since she retired from professional ballet she has been teaching regularly in teacher training courses, and has worked with athletes such as Aston Villa Football Club where she uses yoga to drive better performance. Her aim is to guide others so they may also experience the many amazing benefits of yoga to the body, mind and soul. Please note... Flights and transfers are not included. As YIS is an association, it is mandatory that all students are members, the cost is €20 per person to cover insurance fees.